Our doula said I could look, and so I did, peering over the surgical shield as Pepin was wrested from Lucy's womb. Feet first, then the head, which took some doing, like angling a chair through a doorway. When Pepin was set on a table, suctioned and wiped, her legs were pinned back by her ears. I told the nurse I was impressed by Pepin's flexibility and she looked at me funny. Breeched. Four and a half weeks early. Five pounds, one ounce. "This one's not going anywhere," she said. "Two weeks, at least." It's been 16 weeks since Pepin arrived, folded up like a diver who didn't have a chance to untuck. The 11 days she spent in the Special Care Nursery now seem like one long night, a long time ago, as though it were some other baby who was set on my chest like a starfish, kept alive with a feeding tube. Not the one asleep upstairs, the one with folds we've never seen into, her neck like the dark side of the moon. The one who seems this close to making a grilled-cheese sandwich and watching The Gilmore Girls. This is the last post of Debut Dad. After three months, the debut has given way to a long-running performance and the stage fright has worn off, even if I sometimes still can't think of anything better to do with unwanted food in the fridge than throw it out the door. Pepin seems indestructible now in a way I couldn't have imagined. She sleeps two five-hour stretches at night and is no longer terrorized by the bottle, though she's still touchy, like undetonated ordnance. We've passed from a war zone into a minefield and settled in. Not because she's any less demanding, but because we are. We've retracted, pulled back the furniture of our lives so she can take up as much room as she needs, which of course is as much as we have. A couple weeks ago, we returned to the Special Care Nursery at Methodist Hospital to deliver care packages — clothes, books, diapers — for anyone who might need them. It looked the same coming off the elevator: the check-in desk, the double doors that power open, the table in the lobby where we used to eat whatever anyone brought us, huddled like refugees. But the check-in nurse was unfamiliar. And when the doors cracked open, a nurse who'd once put Pepin through her paces took the packages, thanked us, and slipped back inside — the first time we hadn't walked through. There were other babies back there now. We were on the outside, and when the door closed there was nothing to do but go home with Pepin and think about the ghosts we left behind, the people whose skin we'd already outgrown. Q: Are you ending this because some readers last week thought Lucy should make you an every-other-weekend dad? A: Um, no. This was the plan all along. Three months is long enough for anyone to meditate on his child's spit-up at one in the morning, and probably as long as you want to read about it. Q: Is there something you thought about putting in the blog but didn't? This is your last chance. A: Well, this marks Lucy's one and only photographic appearance in the blog (above). I never mentioned the one baby product I'm not sure I'd want to live without: the Boon grass and twig bottle drying rack. Or the video that we and our stroller appeared in, honoring nurses at Methodist Hospital. Also, the Diaper Genie is dead. Self defense. Someone should probably use the Chatter Telephone to notify his family. Q: Are there fellow writers about fatherhood who inspired you? A: Ben Percy has written with enviable honesty and insight about fatherhood, as well as werewolves, a post-apocalyptic reimagining of the Lewis and Clark trip, and the latest personal technology. And he lives in Northfield. I don't know when he sleeps, but he has kids, so I think I know the answer. Q: Do you really wear earplugs at night? A: All night. But not while staying up to feed Pepin at 1:30 a.m. or much after 6 a.m. when she wakes up again, so yeah, all 3.5 hours of the night. Tim Gihring is an editor at the Minneapolis Institute of Arts and a former editor of Minnesota Monthly magazine. His reporting and essays have appeared in Best Food Writing, Fodor’s, Salon, and newspapers around the world. 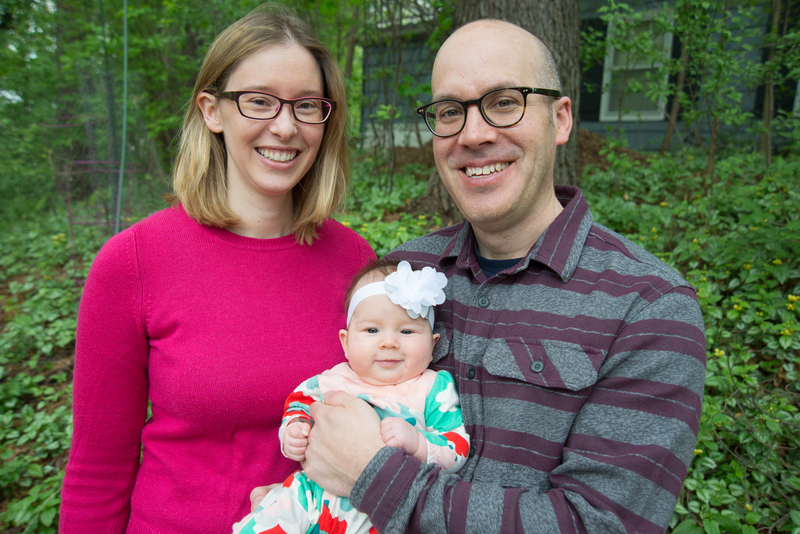 He lives in Minneapolis with his wife and daughter — the impetus for this blog. After three months of blogging about his new baby daughter, Pepin, Your Voices blogger Tim Gihring offers a Q&A about what he's learned about being a new dad. She's surrounded by animals — as her toys, in her books, on her clothes — that will likely be gone in her lifetime. It seems parentally unpatriotic, but we all need some personal time. And it isn't physical space we need; it's psychic space. Don't take it personally, kid. Solo dad: Would you trust this man with your baby? We've entered a world of warnings. Was childhood better when we didn't know better?